Deforestation is the permanent destruction of indigenous forests and woodlands. The term does not include the removal of industrial forests such as plantations of gums or pines. Deforestation has resulted in the reduction of indigenous forests to four-fifths of their pre-agricultural area. Indigenous forests now cover 21% of the earth's land surface. WHAT ARE FORESTS AND WOODLANDS? In a forest the crowns of individual trees touch to form a single canopy. In a woodland, trees grow far apart, so that the canopy is open. Of great concern is the rate at which deforestation is occurring. Almost all of this deforestation occurs in the moist forests and open woodlands of the tropics. At this rate all moist tropical forest could be lost by the year 2050, except for isolated areas in Amazonia, the Zaire basin, as well as a few protected areas within reserves and parks. Some countries such as Ivory Coast, Nigeria, Costa Rica, and Sri Lanka are likely to lose all their tropical forests by the year 2010 if no conservation steps are taken. 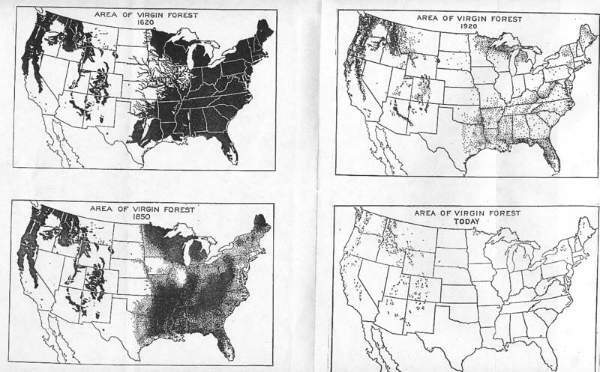 In the United States almost all Virgin Forest has been logged. We need to protect more woodlands and develop them back into Forests. * felling of trees for firewood and building material; the heavy lopping of foliage for fodder; and heavy browsing of saplings by domestic animals like goats. To compound the problem, the poor soils of the humid tropics do not support agriculture for long. Thus people are often forced to move on and clear more forests in order to maintain production. While short-sighted, market-driven forestry practices are often one of the leading cause of forest degradation, the principal human-related causes of deforestation are agriculture and livestock grazing, urban sprawl, and mining and petroleum extraction. Causes include demand for farm land and fuel wood. Underlining causes include poverty, lack of reform. b) The water cycle. Trees draw ground water up through their roots and release it into the atmosphere (transpiration). In Amazonia over half of all the water circulating through the region's ecosystem remains within the plants. With removal of part of the forest, the region cannot hold as much water. The effect of this could be a drier climate. * Soil erosion - With the loss of a protective cover of vegetation more soil is lost. * Silting of water courses, lakes and dams - This occurs as a result of soil erosion. * Extinction of species which depend on the forest for survival. Forests contain more than half of all species on our planet - as the habitat of these species is destroyed, so the number of species declines (see Enviro Facts "Biodiversity"). * Desertification - The causes of desertification are complex, but deforestation is one of the contributing factors.